The Grave of ‘the Most Scientific Engineer in Cornwall’! At the Parish Church of Saint Gwinear in Cornwall, we have a very special grave to see. What’s so interesting about these pair? He was engineer to some of the principal mines in Cornwall up to the time of his death. In 1825 Mr. S. Grose first introduced clothing the cylinders, nozzles, steam pipes, &c., in an engine at Wheal Hope mine, and in 1827 he carried out his plans in an 80in. engine at Wheal Lowan mine; he also increased the pressure of steam there, obtaining from this engine a duty of 60,000,000. His engines were always characterised by a strict attention to detail, which displayed a keen discernment on the part of the designer. We had the pleasure of his acquaintance, and much admired his kind disposition and unpretending manners. He lived not to astonish the world with very brilliant discoveries, but he “Did good by stealth and blushed to find it fame”, and left the world bequeathing to engineering science his improvements in the Cornish engine, which rank first in importance since the time of Trevithick and Wolf. Samuel junior was the son of Samuel Grose senior (1764-1825) who managed Dodington Copper Mines in Somerset and held positions at mines in Cornwall, including Wheal Alfred. This makes him the nephew of Matthew Grose (1761-1824) who was a Mine Agent at Dodington Mines. Matthew’s memorial, also at Gwinear, is covered in this post. Samuel Grose junior is the first cousin of John Grose (1793-1842), the grocer and draper from Goldsithney, Perranuthnoe, Cornwall who also has a memorial at Gwinear. On the photo (above), it can be seen in the background. Likewise, Samuel Grose junior is the first cousin of Matthew Grose (1788-1849) who migrated to Foxdale, Isle of Man. This cousin was a Mine Agent at the Foxdale Mines from 1828-1846, before opening a ‘fine granite quarry’ near Foxdale. The details and date on his Will, match perfectly with those on the grave. Although it is well documented Samuel was born at Dodington or Nether Stowey in Somerset, whilst his father worked there, we don’t have a baptism record, yet. Anne [Ann, Nanny] Grose (nee Vivian) was the daughter of John Vivian and Mary Carne. No definite baptism record yet. From the census records she was born in London around 1791. (There is a baptism record in Gwinear for Anna Vivian, baptised 16th Feb, 1796, daughter of John and Mary which may be worthy of further investigation). From the Cornwall OPC Database, Samuel Grose “the younger” and Anne Vivian married 23rd July, 1812 at Gwinear. His rank/profession is given as ‘gentleman’ on the marriage record. The witnesses are John Vivian, (likely her father) and John Vivian junior, (likely her brother). 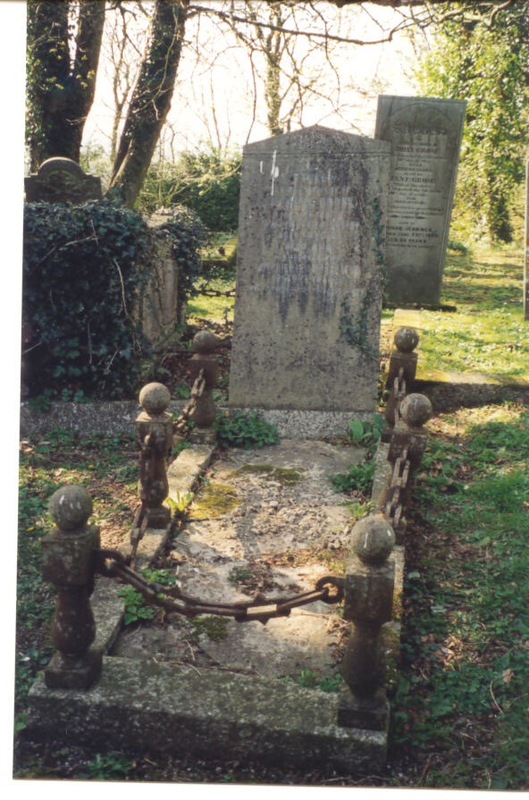 On the Cornwall OPC database, see a burial for a ‘Nanny Grose’ in Gwinear that fits. FreeBMD. England & Wales, Civil Registration Death Index, 1837-1915 [database on-line]. Provo, UT, USA: Ancestry.com Operations Inc, 2006. An ordinary looking grave for an extraordinary engineer and his wife! From exploring the associated records we get confirmation that this is their grave. Both Samuel Grose junior and his wife Ann[e] were buried here at the Parish Church of St Gwinear, Cornwall. In the next post, we’ll have a quick look at which other family graves or memorials we should expect to find here at Gwinear, Cornwall. Excellent info, & good read. Thanks for reading. Glad you enjoyed it.